Chem-Dry's World Famous Pet Odor Remover is absolutely the best pet urine cleaner out there. I'm a professional carpet cleaner but I'm also an avid user of this pet urine treatment. I have used it while training my dogs and without fail it get the odor out with hardly any work. If you have fresh urine deposits in your carpet or upholstery this cleaner works magic. 1) Blot up the fresh urine deposit with a towel or paper towels. 2) pour the Pet Odor Remover on and around the area where the urine is. 3) Lightly blot the area with a paper towel. 4) Leave a towel on the treated area for 24 hours. Those 5 steps are all that is needed to remove any and all pet urine deposits in your home. 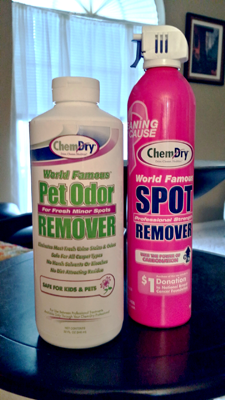 If you live in Tampa FL and have an interest in getting your hands on a bottle of Chem-Dry's World Famous Pet Odor Remover give us a call. In need of a pet odor remover in Tampa FL call Chem-Dry of Tampa.